Laura Wasowicz, curator of Children’s Literature at the American Antiquarian Society is delighted to share her recent research on New York picture book publisher McLoughlin Brothers. Rising from the gritty printing district of lower Manhattan in the Antebellum Era, McLoughlin Brothers blew the international picture book trade wide open with its embrace of cutting edge technologies like the mechanized color relief process of zinc etching and branding techniques that are still strikingly modern today. 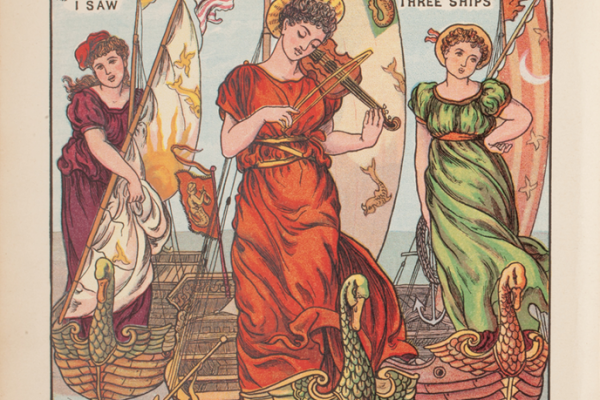 McLoughlin dominated the increasingly international picture book market of the late nineteenth century partly through issuing unauthorized “pirate” editions of picture books featuring the work of British illustrators like Walter Crane before the dawn of international copyright protection. McLoughlin essentially undercut and stamped out its competition both down the street and around the world. “Radiant with Color & Art” is drawn from the great repository of McLoughlin archives held at the American Antiquarian Society, recently the subject of a major exhibition held at the Grolier Club and a full-color exhibition catalog now available through Oak Knoll Books. Come celebrate the legacy of McLoughlin Brothers with us on April 5th! Laura Wasowicz is curator of children’s literature at the American Antiquarian Society. She assists researchers in accessing relevant titles from the AAS Children’s Literature collection and acquires and catalogs additional titles for the collection. She also promotes the collection through lectures, articles, and the Nineteenth-Century American Children’s Book Trade Directory database. Before coming to AAS in 1987, Laura worked at the Ryerson Library of the Art Institute. She has a B.A. in History from Rockford College, an M.A. in Library Science from the University of Chicago, and an M.A. in History from Clark University. Images: Illustration after Walter Crane from The Baby’s Opera (New York: McLoughlin Brothers, ca. 1877). Courtesy of the American Antiquarian Society.